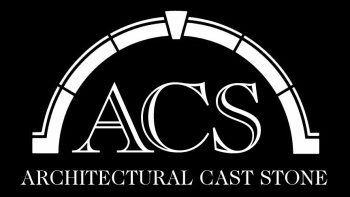 Incorporated in 1989, ACS serves the precast concrete and cast stone markets in the Midwest, East Coast and Middle South. Owned and operated by builders and developers the ACS team has a much broader knowledge of building construction than most manufacturers. Our holistic approach and extensive construction experience ensures that challenges and problems are identified early on in the process, and solutions offered to problems encountered during construction are practical and timely. Holding both the APA & CSI certifications and with approvals from numerous agencies (DOTS, PBS, NYCSA, CPS, MTA, etc. ), ACS can guarantee both the quality of its products and the efficiency of its processes thereby helping to ensure the cost effectiveness and success of your project. The key plant personnel at ACS (managers and supervisors) have over 400 years of cumulative experience fabricating quality precast and cast stone products. The average tenure for personnel is 18 years. Our team, which includes multiple groups of fathers, sons, mothers and daughters working together, uses the best of old school techniques and cutting edge technologies. From “running” plaster to 3-D laser scanning, ACS has the talent and tools necessary to ensure top quality craftsmanship on all of our projects. Ensures accuracy and provides a drawing with each proposal showing exactly what the scope of work that is included in our bid, a very helpful tool for comparing our take offs to yours and our competitors’. Our purpose built ERP Software. Titan provides ACS with the most sophisticated tools available to manage all aspects of a project from order entry to shipping. This allows ACS to provide excellent Customer Service support to our customers providing them real-time production and shipping data. Unlike most manufacturers who utilize old technology CNC equipment, ACS utilizes Streamline Automation’s “FROG” system. The “Foam Replication of Organic Geometry” equipment allows ACS to produce a large volume of molds for complex pieces efficiently and accurately. The combination of the CNC hot wire, CNC router and 3-D laser scanner gives ACS unprecedented capabilities. This allows architects and designers to detail much more complicated profiles and designs while keeping their project on budget and on time. Our batching system in conjunction with an automated admixture system provided by BASF and an automated color system provided by Dynamic Color Solutions, ensures the accuracy and color consistency of all batches. With the ability to utilize up to 17 coarse and fine aggregates, ACS can offer one of the broadest ranges of mix design offerings in the industry. Our production facility utilizes barcoding for all molds and for individual piece parts and their drawings. Unlike an environment with paper drawings, the barcode system virtually eliminates errors as a result of reading the incorrect drawing when setting up or finishing a piece. Utilizing monitors, tablets and bar code scanners, barcoding gives ACS a measureable advantage over less-sophisticated producers. Our custom built automated wet cast line utilizes polyurethane tooling (molds) and on large to very large projects that advantage allows ACS to deliver custom and complex pieces at prices close to standard cast stone costs. By utilizing laser scanning on restoration projects, complex restoration replacement pieces can be fabricated and delivered to the jobsite before demolition commences thereby dramatically reducing the onsite construction time. Using 3-D scanning can also be used to collect accurate field data helping to eliminate errors associated with templates. ACS is committed to meeting, and when possible exceeding, all regulatory and plant certification requirements. Perfect scores on unannounced plant certification inspections, Zero T-12 certification on our manufacturing buildings and offices and a state of the art water treatment plant that not only treats 100% of all water used in processes but also can address 100% of all facility and yard run off are just a few examples of ACS’ commitment to super compliance. With continuing efforts towards achieving a zero waste stream, reducing power consumption and ever increasing usage of recycled materials, ACS is committed to reducing the carbon footprint of the built environment. Holding both the APA & CSI certifications and with approvals from numerous agencies (DOTS, PBS, NYCSA, CPS, MTA, etc. ), ACS can guarantee both the quality of its products and the efficiency of its processes and help to ensure the success of your project. Please look at our photo gallery. Our talented people, who average 18 years of service at ACS, have produced countless successful projects throughout the US. From buildings to small products; bridges to streetscapes; public parks to control towers; ACS has the talent, experience and commitment to make your project a success.